“…what’s that?” my friend asked, pointing to my jar of rags and basket. And in that moment, my brain stopped working. I stared blankly for a moment (I envision drool dripping from the corner of my mouth) before I mumbled something about trying to be more green. Or something. But that’s not it. Well, that’s not all of it. Yes, this saves money on buying paper towels, but by the time you buy the cloths and the cute, huge jar, you’ve invested around $25-30, and that could buy a lot of paper towels. And yes, it is a lot more eco-friendly, and I DO care… but if I’m being fully honest, I’d have to say that the green factor wouldn’t be enough in and of itself for me to change. So, why DO I use these? I strongly prefer the rags to paper towels for scrubbing, cleaning, and absorbency. I’ve been using them for over a month now. It was a hard adjustment at first, but on this side of breaking my dependence on paper towels, I prefer it. Think of cross contamination when you’re reusing rags. This jar cost $9 at Purgatory. You’ll want at least a dozen rags or bar towels. I don’t remember how many I bought, but it was a lot. 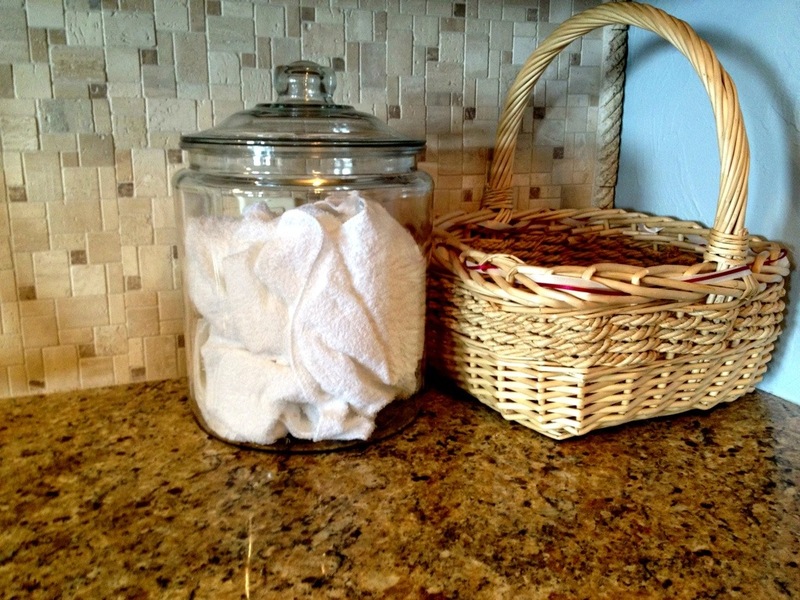 I like to keep a pretty basket next to my jar to throw my dirty rags in. It’s not as gross as it sounds. Or at least, I hope it’s not. Anyway, let me know if you try this. Join me on this side of crazy. Baaaa.